Dustin grew up on the shores of Lake Ontario in Rochester, NY where his older brother and sister were the first to identify his more irritating personality traits. He now resides in the heart of Washington, DC, where his eclectic taste in music is inexplicably much in demand. Though known for his high-energy electro-house sets, Dustin often prefers playing smaller venues and shaping the mood of the crowd to the theme of the event - picking and choosing from house, funk, mashups, classic rock, and jazz. "I'd rather take 200 people on a four hour Sunday afternoon journey than turn 500 dancers into a sweaty mess from 1am-2am. Fortunately, I usually get to do both." 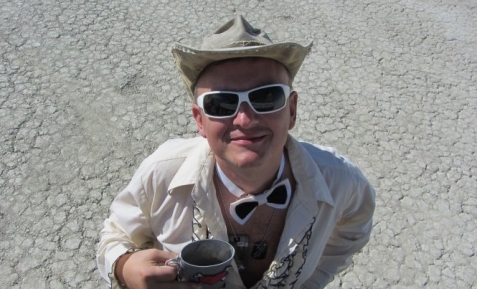 Dustin has been attending Burning Man since 1998, contributing to esplanade sound camps, theme camps, funded art projects, art cars, and much general mayhem. He has performed at more than 30 regional burns, including Playa del Fuego, Apogaea, Transformus, and Frostburn. In 2009, Dustin joined the DC-based Mischief crew, responsible for the annual Naughty Snow Ball, Intergalactic Speakeasy, and other events. Dustin has a full-time job that has nothing to do with any of this, and is a terrible self-promoter and networker - which is why you've probably never heard of him, and why all of his mixes below are several years old.